Now that I have reached over 100 fans on facebook, it's time for a giveaway to say thank you! I wanted to include one of my new products, which is why I didn't do this as soon as I had reached 100 fans. 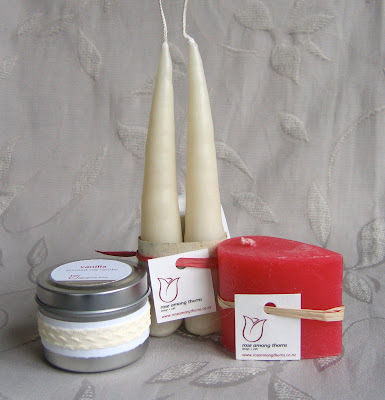 The prize pack up for grabs is: 1x mini teardrop candle, in your choice of rose, frangipani, or rainforest fragrance, 1x pair of hand-dipped tapers made from recycled convent candles, and 1x small soy tin candle, in your choice of rose, frangipani or vanilla. To enter, all you need to do is be (or become) a fan of my facebook page, and leave a comment below this post saying what your favourite item from my shop is. If you tweet, facebook or blog about this giveaway, you'll get an extra entry – just don't forget to mention in your comment that you have done so. The competition will run for a week, and will be drawn on the 15th June. Good luck, and thanks so much for all your support! i love love love your rose scented tear drops....just gorgeous! Ooooh the Floating Citronella Candles are so cool!! Your Soy teacup candle with the green and gold trim is a favourite. i love the rustic look of your hand dipped tapered candles. i also told the facebook peeps. your candles are beautiful. Love your pair of tapered red candles - you are so clever!!! Hi, I'm a FB fan. I like the candles in the travel tins because among other things the tins cintain the melted wax rather than it running onto my table! I'd love to try the frangipani candles, frangipani is about my most favourite scent ever!